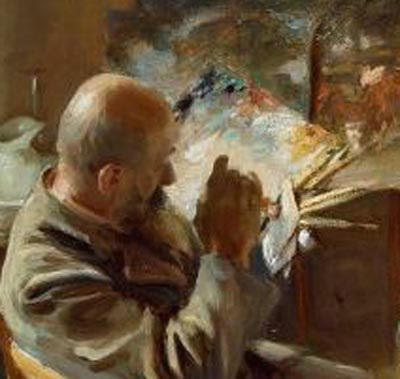 Palettes appear in many paintings, especially self-portraits, and they reveal something about the artist’s thinking and working process. 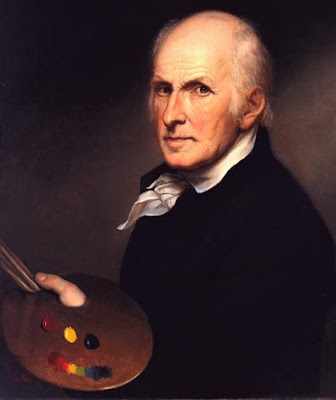 Charles Willson Peale (1741-1827) doesn’t show his working palette: after all, where’s the white? Instead he wants to let us know that he understands Isaac Newton’s theory of primaries and color mixing. In the Middle Ages, artists kept their paint in shallow containers like shells or saucers, and expressed a dislike of mixing paint. 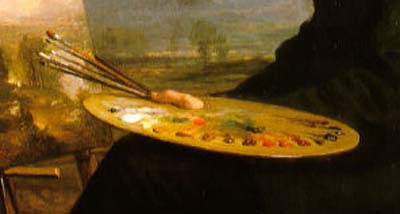 The first reference to a mixing palette was from an account of the Duke of Burgundy in the 1460s, where he described “trenchers of wood for painters to put oil colors on and to hold them in the hand.” Often palettes were set up by assistants, which helped standardize the procedure for laying out the colors. The practice of mixing colors on a palette was common in the early 1500s. By 1630 it was a lively topic. 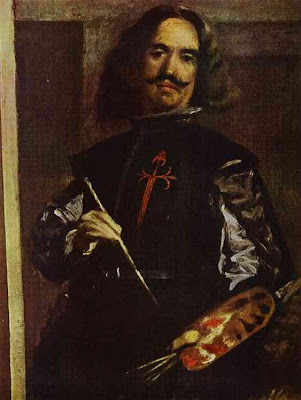 Vasari said of Lorenzo di Credi that he “made on his palette a great number of color mixtures.” Above, Velasquez painted himself in Las Meninas in 1656. Note the sequence: red and white, yellow, with dark and cool colors away from the thumb. 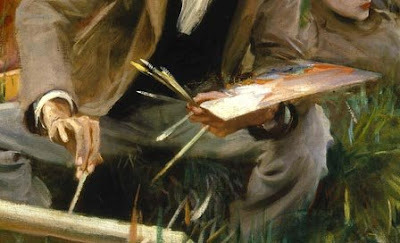 This detail of a portrait of Asher Durand by Daniel Huntington, reveals a typical arrangement, with light colors at the top, that is, near the thumb hole. As this self-portrait by Milly Childers shows, often bright red pigments like vermillion were placed ahead of white because red was seen as a valuable, intense color, different from all the others and in a sense brighter than white. Above and below are by Sargent. Blues, greens, and black went away from the thumbhole. The paints were usually placed on the outer edge, away from the body, which makes Paul Helleu’s layout (below) a bit puzzling—there’s a real danger of getting paint on his jacket. References to palette knives show up around 1650. Elaborate premixed tints became a common practice by the late 1600s. During the next century artists more frequencly used a “loaded palette” with fully developed gradations of tints and variations. A Swiss painter’s manual in the 1820s compared the gradations on the palette to the notes of a piano keyboard. Whistler was said to spend an hour preparing his mixtures. Delacroix’s assistant reported that it sometimes took days to set up his master’s palette. 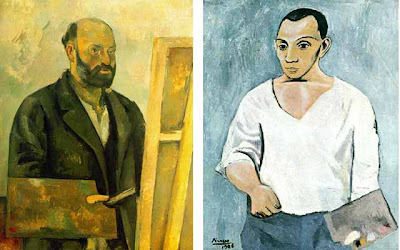 Cezanne (left) and Picasso (right) were evidently either ignorant or indifferent to these traditions, and showed their own palettes hanging vertically with a few confused and random smudges of color. Now with the resurgence of realism and a revived interest in the craft of painting, palette arrangements are a hot topic again. Many artists work on a tabletop or taboret-mounted palette instead of a hand-held palette. Let me know how you set up your palette, and I’ll try to do another post in the future about contemporary methods. My source for this post is Color and Culture: Practice and Meaning from Antiquity to Abstraction, by John Gage, Little, Brown, 1993. Thanks for another fascinating post James! My own palette is closer to Cezanne and Picasso, a very random arrangement. And I only stick to primaries. It means I spend more time mixing during a painting, but I think it means you are forced to control colour, having to mix the same tone several times over. I cant resist this post, Ive now collected 78 artist palettes, and my collection continues to grow. And a purple mixture of Cobalt and Alizarin, a mixture apparently used by the old masters, however they may have used Rose Madder in place of Alizarin. If absolutely needed, I'll put out Raw Umber, Burnt Umber, or Naples Yellow. I find with the palette above I rarely need these 3 colors. I came up with this palette and its arrangement, after studying all the palettes I collected. I have Ivory black and Raw sienna next to each other, because I mix these to colors to draw with. 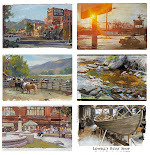 For plein air I stick to the palette you suggested, which is John Stobart's palette of 6 colors. In this order, Flake White, Ultramarine Blue, Burnt Sienna, Cad. Lemon, Winsor Red, Perm. Green..
p.s. Notes on Sargent from John Collier's book. He disapproved (Miss Heyneman continues) of my palette and brushes. On the palette the paints had not been put out with any system. Thanks, Moyse. For those who don't know, Paul Moyse is a brilliant caricaturist from the U.K. Check out his blog "The Art of Moyse" for amazing demos and insights. Jason, I was thinking of you when I worked on this post, because you're the expert on palettes. I like the way you set yours up, and the logic of putting the paints more or less in spectral order makes the most sense to me, too. I find when I'm painting outdoors I grab all the tubes I think I'll need and lay them out in order right on the palette, and then squeeze them out. That way I can edit out colors or switch their order before I take off the caps. A fascinating post, as usual. I'm always interested in how other artists set up their palettes and which pigments they prefer and how they arrive at the colors they do. All grist for my own mill. I like a limited palette both because it suits my color sense well and because it lends itself to control and color harmony in the painting. For example, I mix Winsor Violet (dioxazene) with Cadmium Yellow Light and touches of Cadmium Red for earth colors. They resemble Raw Sienna and Yellow Ochre, but they have a richness lacking in the latter, and hold up better when mixed with the cool colors (Ultramarine Blue, Indanthrine Blue and sometimes Prussian Blue)and color harmony will be a given, rather than something that I'm working at, as all the colors will have some pigments in common. I mix all my greens using either Prussian Blue or Indanthrine Blue and Cadmium yellows. I use Flake White and never use black for shades of a color. I find I can get a perfectly good black using Burnt Umber and Ultramarine Blue, sometimes further darkening it with a little Dioxazene Violet. You can get a really intense black using Alizarin and Prussian Blue. For a palette I use a disposable palette on top of a taboret. I'm a beginner; my palette is a piece of glass taped to foam-core, and I group colors that I'll be combining together and mix my range of colors from those nearby. If I'm finished with a color (or think I am), I'll mix it into a different color. EX: If I'm trying to make a skin tone, I'll put white, orange, and yellow next to each other, with a darkish blue, a brown, and dark rose red nearby. I guess my palette is a bit of a mess. Great post, I am int collecting palettes as Jason is of different painters as well. Whistler is one of my favorite painters and printmakers, so I have included to links to pictures of his palettes, notice though how one, the one in Glasgow at the Hunterian Museum, which has a huge amount of his studio contents as well as paintings. Notice how in this palette he has white in the center, on the left yellow ochre, raw sienna, burnt sienna, raw umber, cobalt and mineral blue and to the right vermilion, venetian red, indian red and black. I use for the most part a palette of 9 colors plus Black and White. Vermilion or Cad Red Lt.
and Persian Red and Cad Lemon Yellow which brings it to 12. I like thinking in threes or triads as I can add or subtract from this down to three colors if need be as that is the root of the palette. I have been using Munsell to pre-mix palettes as well. I know a thousand words say more than a picture, but I'm lazy today. This was painted with this dried up palette using these tubes. I actually forgot quite a different palette I use. This is my very first real painting that I'm working on (from left to right as you can see) and this is the limited palette I'm using for it. Thanks, Erik for the glimpse in your studio. It's nice to see drafting curves and ink bottles. Am I right in guessing that you are left-handed? What are those "Acryla" paints--acryla-gouache? Gorgeous landscape, too, makes me wonder what's around the bend of the road. That looks like egg tempera and dry pigments. John and Jeff--I really appreciate your tips on color mixing, and those links to Whistler's palette. I have found recently that choosing a limited number of colors, or using a simple color idea like opposition between two colors works a lot better then having any set notion of what colors I should have on my palette. It seems if I can discover a simple underlying color idea to the subject, like and arrangement of oranges and blues or reds and greens, much of the unnamable color can be created from the complimentary pair. In other words you can worry more about matching value and intensity of what you see and you almost automatically get nice color and your palette becomes very simple. So I find myself choosing from colors like ultramarine blue, green blue, cadmium red, permanent rose, and cad yellow and lemon yellow along with cremitz or flake white. Not using them all at once but maybe choosing two or three. It is almost like you already have some sort of harmony then. I do get confused by the earth colors older artists use for reason. I have tried using ivory black and yellow orche and brunt sienna with some success but the other colors seemed to produce more satisfying results especially in landscape painting. Curves are hardly used though. Cryla is the top acrylic series of Daler-Rowney. Indeed tempera (hence the eggs I took out of the fridge). Remember your poll for mediums?Resulted in 2 hits for 'tempera', of which I represented 50% of the population. Thanks for pointing out moyse's site. Indeed nice twisted portraits and 'you-tubes'. I tried using the hand held palettes when I first got back into painting after a 20 year lay-off and found taht I kept putting them down for one reason or another and still worked off them,so I eventually went to a sheet of glass ( 18" x 16" )on top of a small table whch holds my brushes and turps and what nots as I paint. The arrangement of my pigments remained the same tho. Under the glass I have a sheet of white paper with the names of the colour on it in their respective places ( I tend to forget which goes where ). I don't usually squeeze out all the colours all the time, but usually just what I am working with for each particular painting, and some of the colours rarely ever see the glass. I have no idea when or why I picked these colours, but those are what I use. I forgot I also use Burnt Sienna which I place in the reds. I'm left handed so my palette is going from left to right, light to dark and yellow to red to blue to green, a spectrum palette. For landscape I don't use any umbras as they pull to much to yellow. However they do make some nice greens. Ernst van de Wetering's book "Rembrandt: The Painter at Work" has a very informative chapter on the development and use of the palette before, during and after Rembrandt's days. Yet another reason to recommend that book. It somehow relates to the earlier post James made on this blog about the method of finishing one part of a painting at a time. Common practice in the 16th and 17th centuries seems to have been to do just that, preparing a palette for a specific part rather than the painting as a whole. Hi James, I have two main palettes that I use with a few extras thrown in when I need them. Here is the bare bones one from top to bottom along the left side of my palette. If I use the split primary it goes like this. From top to bottom again. and up in the far right corner away from everything else a dab of Phthalo Blue. It gets into everything, so I try and keep it separate. Sometimes I stick some Indian Yellow on there for mixing greens. I use that a lot more when painting in the U.S. and almost never here in Mexico. There are always exceptions, but these are the standards for me. I don't often use a hand held palette. I find I am cheaper with my paint if I can't close a lid on it and take it home. I use open box m's and another folding palette that I made. They both can save unused paint. Besides, my left hand is always full of brushes and a rag. Here's another example that I saw recently, Cecilia Beaux's portrait of Alexander Harrison with his palette; and another, William Merritt Chase's The Artist in his Studio, both pulled from A Ciencia e a Arte. My palette is a 12" x 16" sheet of glass under which is placed a neutral gray sheet of paper. It rests on a tray attached to my easel so that it is between me and the easel. I have arranged dark, transparents on the left edge, mid-value opaques along the longer edge away from me, lights along the right edge and dark neutrals along the edge closest to me. My colors are: darks--quinacridone gold, transparent burnt sienna, alizarin crimson, dioxazine purple, F.U. blue, thalo blue, thalo green, Daniel Smith sap green; mid-value opaques--thalo blue+white mix, FU blue+white mix, dioxazine purple+white mix, alizarin crimson+white mix, Gamblin cadmium red light, Gamblin cadmium orange, Utrecht yellow ochre; lights--Utrecht hansa yellow light, Winsor Newton titanium white, permalba white; dark neutrals--Utrecht burnt umber, Rembrandt raw umber, ivory black. This is my own system which has been evolving for 40+ years. Wonderful post and subject, James. I recently started painting in March, something I hadn't done since a teenager (over 30 years), and have been trying to figure out my palette. Hello! I thought I would throw in my own palette thoughts. I usually paint in acrylic and gouache. When I paint in acrylic, a butcher try is employed with a disposable palette and wet paper towels. I put white in a corner and then lay out my lighter colors closest to the white then darker away from the white. I like to have my cool colors on the long side and warm on the short. Gouache, I use a water color palette, there was order, but as I get more colors I just put them were I have room. Thanks to James and everyone else with so many fun ideas! If I remember correction, Whistler never looked at his students painting, only their palette. He felt he could learn more about a person from his palette than anything else. Interesting and I think there's something to it. For acrylic, I work on an 8x10" sheet of glass with masking tape on the edges, and since I generally place it on a table instead of holding it, the order of the colors is less important (since I turn the glass so that whatever I need is closest). It's been awhile since I painted with acrylic, but generally I group warm colors, cool colors, and then browns/black/white. My watercolor palette I have with me, so I can be a little more specific. It's a very cheap plastic rectangle which I really should replace with something better, but it fits in the box I use to keep all my supplies so I haven't yet. Hi, Jim--I used to use a different palette with each painting--depending on the subject and how the color sketch had worked. Of course, I was working in acrylic, and it really helps to have a lot of pre-mixed tones. 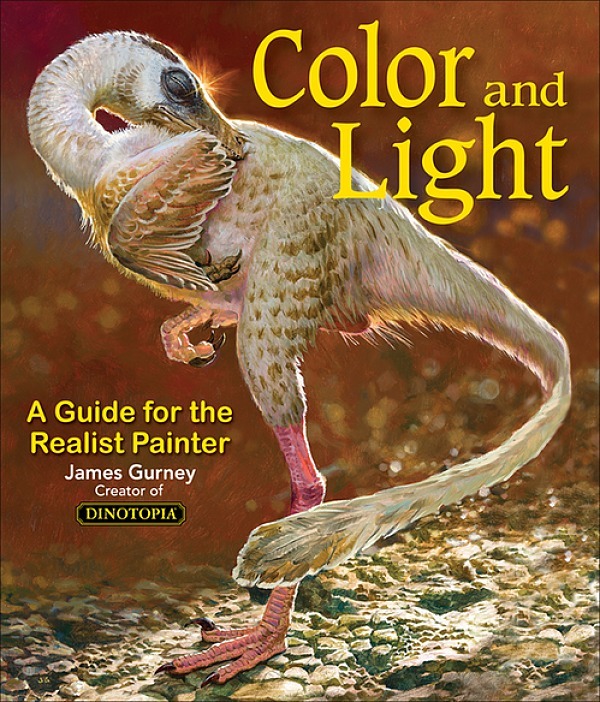 I'd usually find one tone to predominate (something like "Light Lilac"--I was a fan of those Tole Painting acrylics)and use a little of it in almost every color to remove some of the harshness and over-crispness that acrylics can get. Nowadays, I'm using either of two limited palettes--the John Stobart 5-color one, or the split-primary. It's surprisingly effective and capable. I very rarely have to haul out other colors, usually a cobalt blue for a sky effect, or one of the transparent colors for a glaze. Mostly I work opaquely, so that's pretty rare. The order is as I've written, since the blue and Sienna are responsible for almost all the darks and should be next to each other. The next comes the green and then the red--red goes mainly toward yellow since I find the perm. green and yellow combination too...vivid for much use, although it's good to know it's there.The yellow is next to the white and I'll often mix a little in to the titanium to take some of the coldness out. That'll teach me to post before reading through. Yeah, I use the Stobart for big stuff, too. Nick, thanks for mentioning the Stobart limited palette, and I appreciate your sharing the good logic of how you lay it out. And thanks everyone else for all the really useful information. I'm such a color junkie at heart, but enjoy limited palettes. Therefore, I use a number of different palettes depending on medium, subject, season, space (small pochade box or larger mixing area). Here are a few of my favoritesl for oils. I also like the Kenn Backhaus palette. It's a bit unusual, but it works! I always arrange these along the top of the palette with the white on the left, then the other colors in order from left to right. My palettes are all different---from 1/4" cut glass tabletop palettes to paper palettes to pochade box palettes to traditional handheld palettes. I like them all for different reasons.